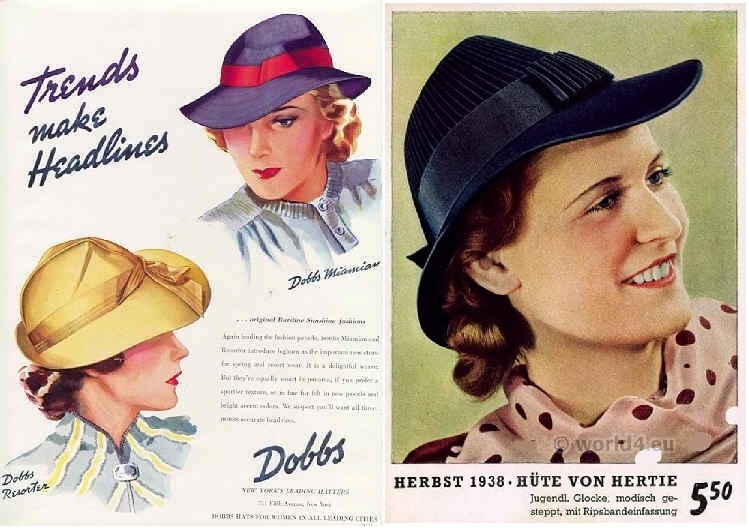 I always suspect that a good amount of the appeal of the 1930’s fashion is the flaunting of elegance with chic, completely accessorized outfits. I can’t think of a better face for this in the late 1930’s than the famous Wallis Simpson. 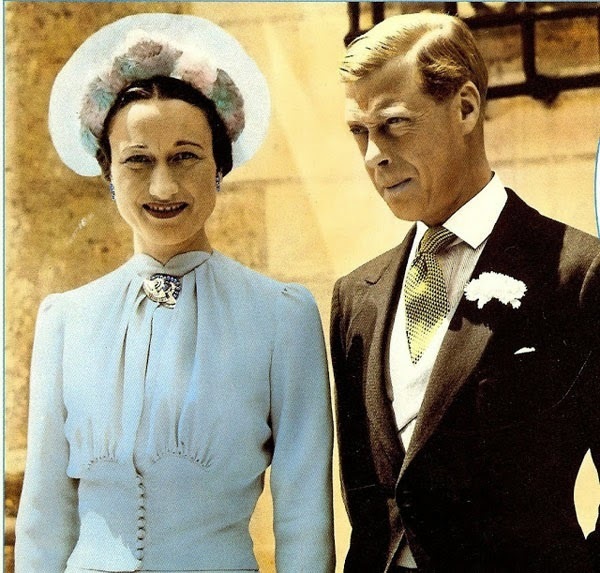 As she was already gracing every news headline in 1937 for her marriage to England’s former King Edward VIII, she became the woman that the most talented designers of the times jumped at to clothe…and boy did she ever wear the fashions! She is quoted as saying, “My husband gave up everything for me. I’m not a beautiful woman. I’m nothing to look at, so the only thing I can do is dress better than anyone else.” Whatever her reasons, she inspired my latest 1930’s outfit. So many details of my outfit make this a very specific 1938 garment, with a heavy nod to ‘Wallis’ in my accessories. I’m not out to overdress, just dress “to the nines” in killer Tyrolean era, late 30’s style! Not only did I make the dress of this outfit, but I made the hat as well, and even broke out my prized 30’s gloves and vintage shoes to boot. This is the kind of outfit I hate to take off! 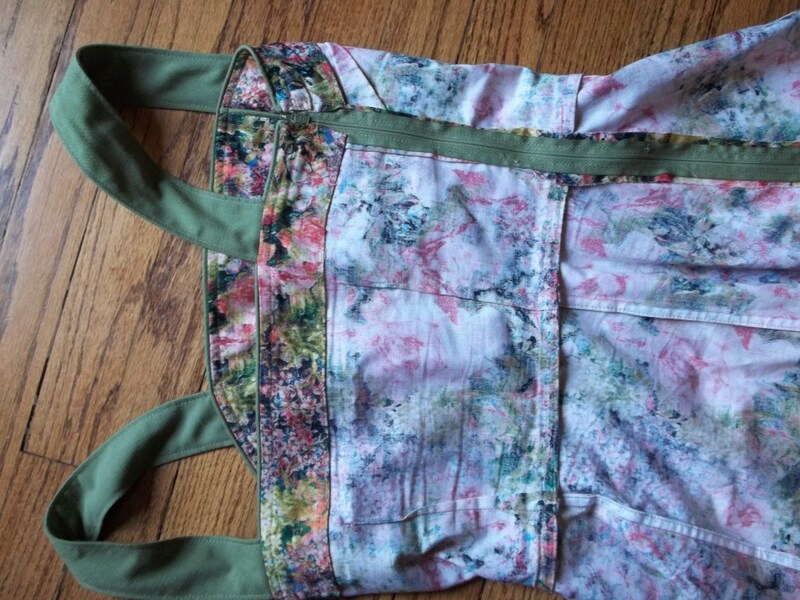 NOTIONS: I had everything I needed on hand – buttons, ribbon, thread, and bias tape. The buttons are authentic vintage from the stash of my Grandmother’s. TIME TO COMPLETE: My dress was made in about 10 hours and finished on May 14, 2017. My hat was finished on May 19, 2017, in only 2 or 3 hours…easy-peasy! THE INSIDES: Half French seams and half bias bound (in red, too, for fun) on the dress while the hat is raw edged inside – it’s felt, after all. TOTAL COST: I’m counting this as free as the supplies were on hand and the fabric has been in my stash for so many years! In the year 1937, Simpson made more than headlines, though. She made fashion history in two dramatic ways – she wore the then shocking but now famous Schiaparelli-Dali “Lobster Dress” as well as sporting the “Wallis Blue” wedding gown designed by the Chicago-born designer Mainboucher. Hollywood brand patterns were well known for imitating the rich and famous, bringing their styles to share with the masses, and there is a trickle-down effect which puts the newest fashion in the hands of those masses at a delayed time. 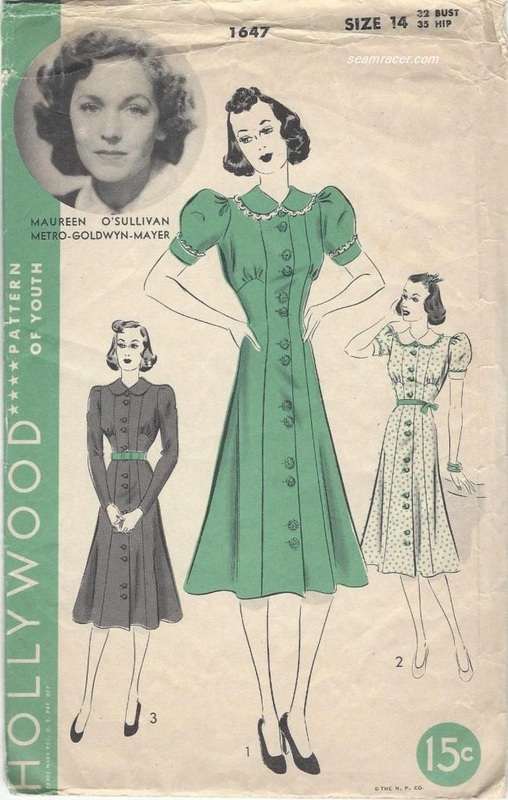 Thus, it makes sense for me to see details of Wallis Simpson’s influence in the Hollywood dress pattern I used to make my dress from the year afterwards – 1938. Hollywood patterns that I see almost always stick with sweet princess styling, which can be complimentary in the way of thinning the body lines, yet overly youthful and conservative with Peter Pan collars and high necks. 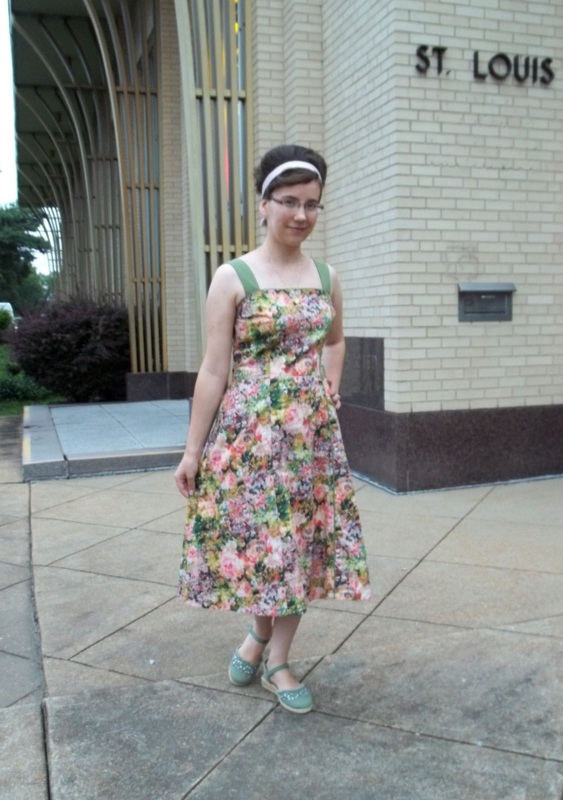 Not for me – not with this dress! 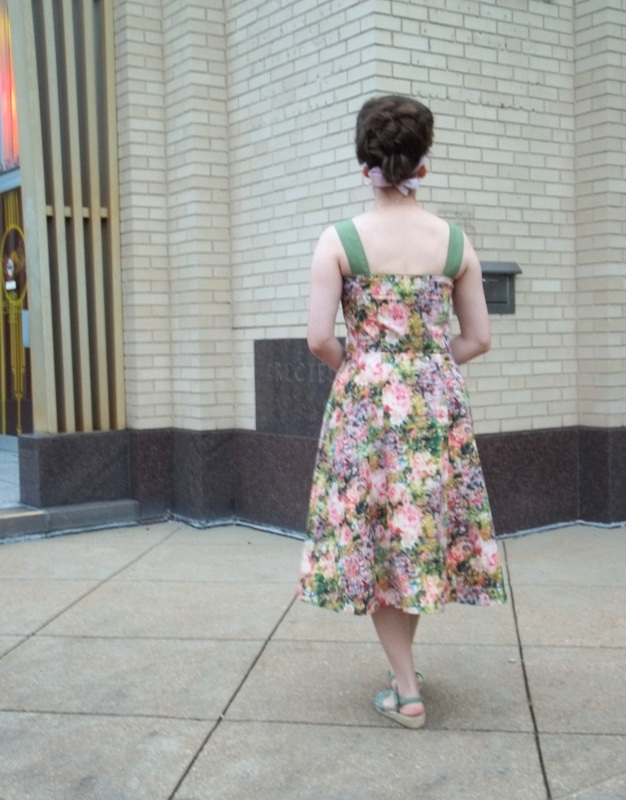 Sure, there’s princess seaming to the front, but I changed up the neckline of the original pattern for an open, adult style, while the dress back (as designed) does have a very 40’s appearance (different from the front) with its darts and defined waist seam. This is a dress which breaks both consistencies of the conventional Hollywood pattern! I’m tickled at how I found a way to complement the original styling and make my dress more ‘grown-up’ and sophisticated by a mere change to the neckline. A good friend of mine helped me realize one of the neckline shapes that are very specific to 1938 – an upturned curve to be the third ‘leg’ of a square neckline. The late 1930’s frequently borrowed from historical garments for new features, particularly those that were severe or heavily restricting, and this type of curving squared neckline, which was popular in the mid to late 1500s 1, had a widespread use on women’s dresses of 1938. 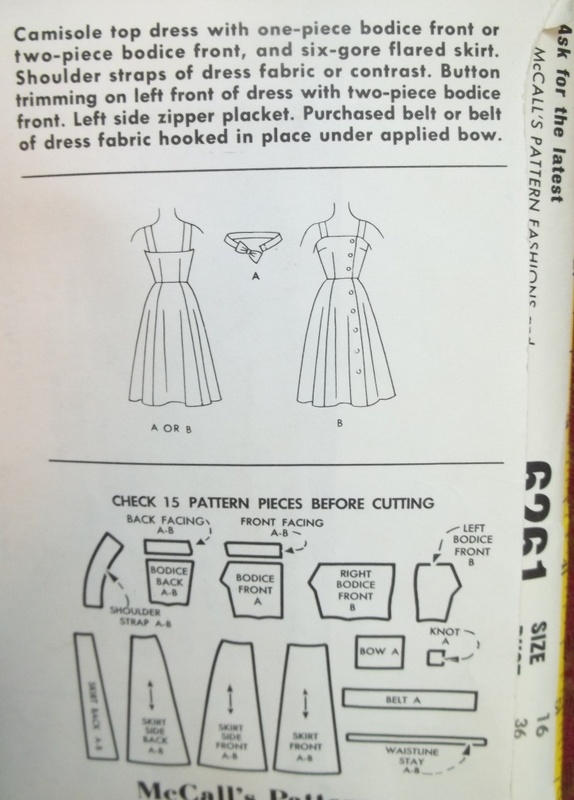 See this Butterick Spring 1938 news flyer for a small example of this. Period revivalism combined with modern touches was especially popular with one of Wallis Simpson’s designers, Elsa Schiaparelli – see her designs from winter 1937 to 1938 2 and many are strongly influenced by historic clothing from around the world. If you read up on history, all that is old become new again at some point, it seems! Anyway, this 1938 neckline adaption coordinates perfectly with the likewise arching bust detail. Wallis’ wedding dress had the exact same upward curving side panel bust gathers! It is such a lovely, subtle, and slightly-tricky-to-sew touch that I don’t really see that much (whether on an extant garment or pattern). If you would want to snag your own true copy of Wallis Simpson’s wedding dress, good news if you can sew! There is a reprinted pattern of it as Superior #114 (year 1939) up for purchase here at the Etsy shop “tvpstore”. Go and drool over it at least, like I did! 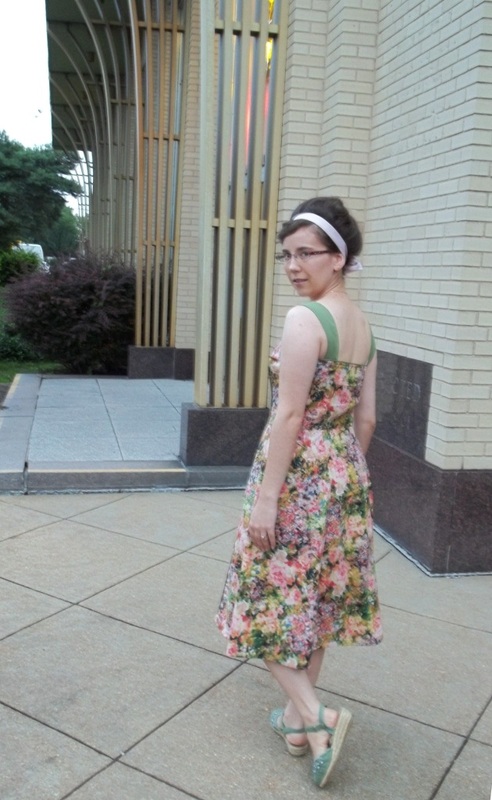 Besides the redrawing the neckline change and making the bust gathers, the rest of the dress was a cinch to sew together. 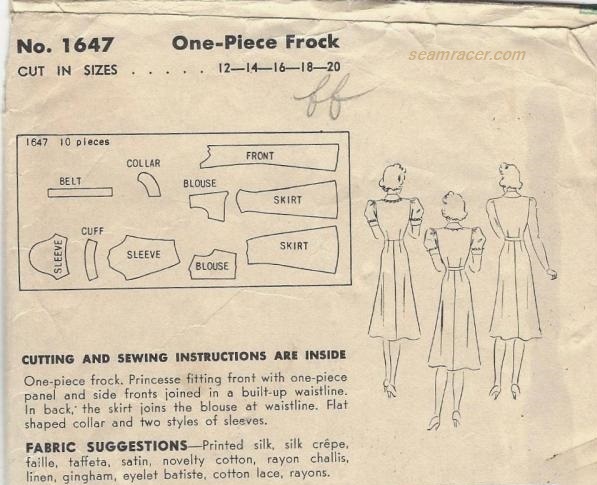 The lines are really simple for the rest of the frock. I did have to grade up to over the amount I really should have needed, and it’s a good thing I did! 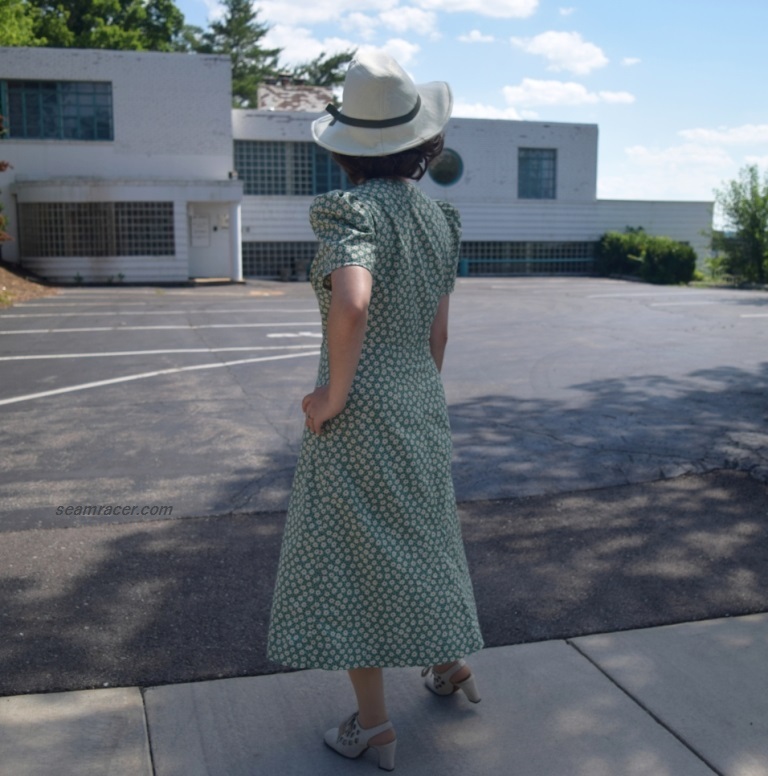 Most 1930’s era patterns I come across run small, besides the fact that a full button front dress cannot be snug, and so I made sure to have extra room rather than too little. 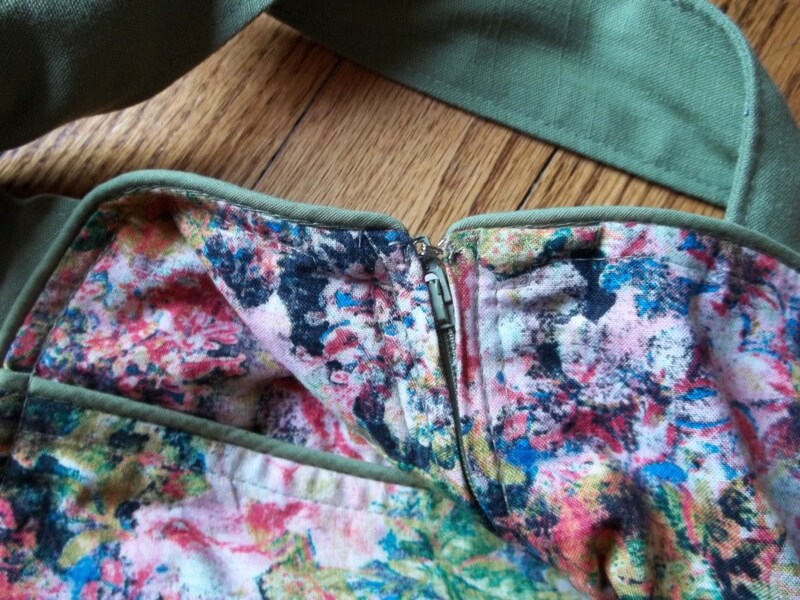 I ended up being able to have 5/8 inch seam allowances, rather than the original pattern allowance of 3/8…too little! The modern sized seams allowed me ‘wiggle’ room to make clean finishing French seams and give myself space (if needed) to take it out if I need to in the future. I want this baby of a dress to last me a good long while ‘cause I love it! The cotton print is a rocking awesome re-print of an original 30’s print. Sadly I do not remember where it was bought. 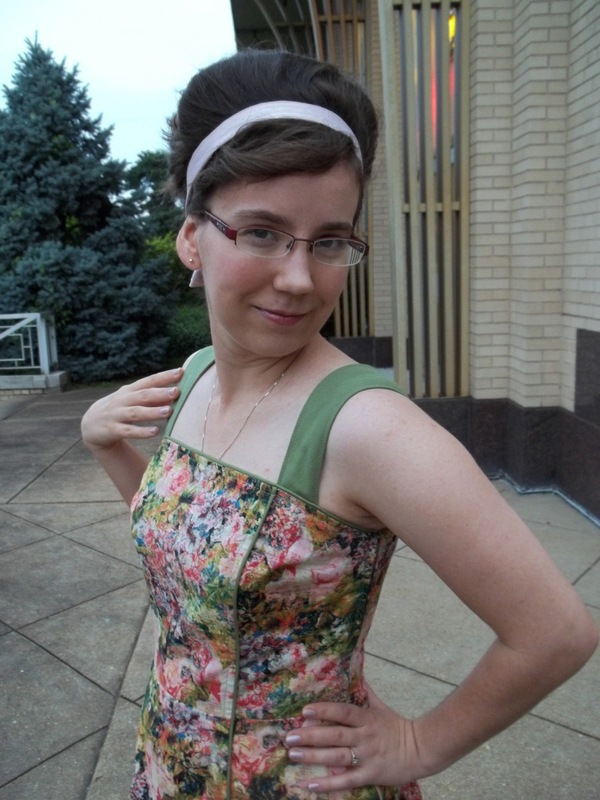 I do have proof of historic authenticity for it, though – see this original dress, sold over at Dorthea’s Closet Vintage. 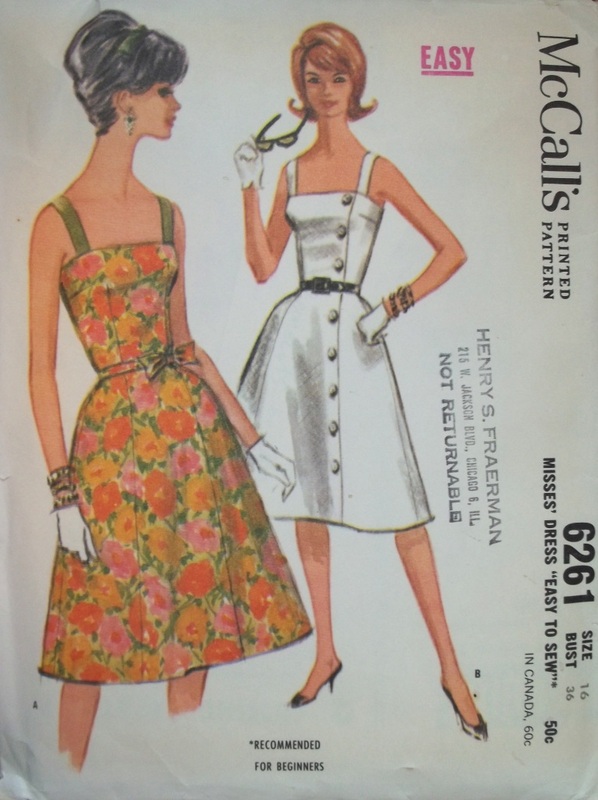 Seeing that original dress ‘sold’ me on the idea of actually using this prized fabric which I had been hoarding…I mean saving for the perfect pattern. 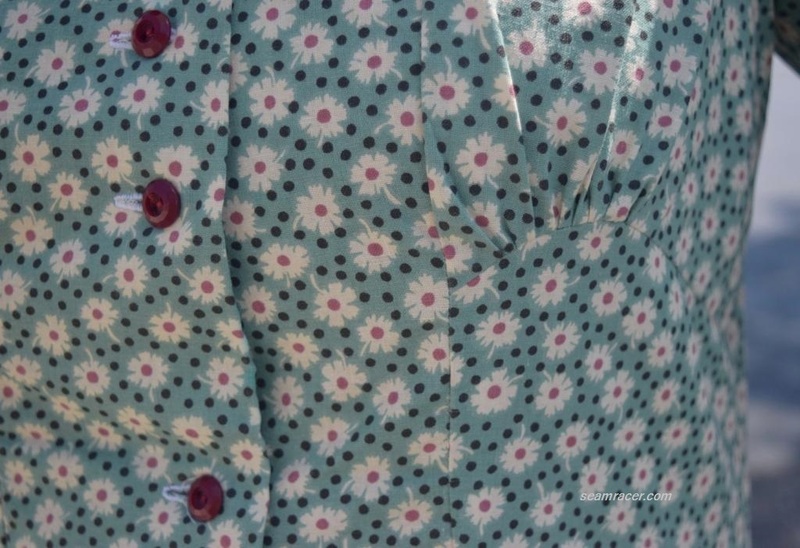 For as cute as the print is with its cheery daises and red contrast, my cotton is not the softest…it is actually quite stiff. For once, a stiff cotton actually comes in handy! 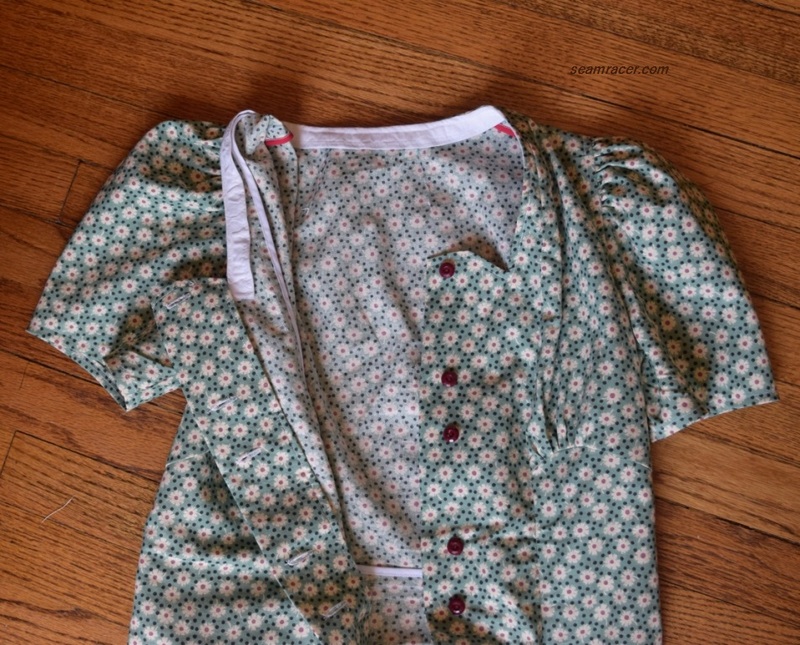 The stiffness lends itself wonderfully to the puff sleeves and the button front as well as keeping the long princess seams smooth and non-wrinkly. Anything softer and I would have had to use some powerful interfacing, with would be too noticeable to look great, I would think. As it was, I used only a small strip of lightweight cotton interfacing down the front buttoning self-plackets and zero supports for the sleeve caps to do their glorious late 30’s obnoxiousness. I had just enough material, too – 3 ½ yards of fabric to work with, which seems like a lot to me, and I just barely fit all the pattern pieces in on it. Whew! Talk about making the most of what you have! 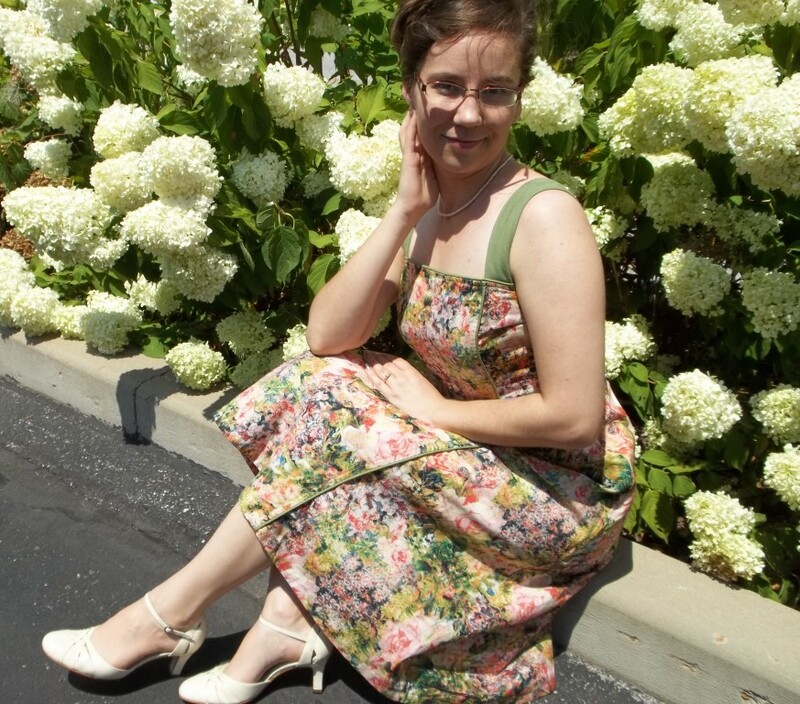 This was obviously a serendipitous match of pattern and fabric. What do you think about that two-at-a-time button placement? Now that I see it done, it was worth all the bother, time, and trouble…and boy, was it ever! It took me 3 hours just to make the buttonholes, cut them open, match them to the other side, and sew the buttons on… all 13 of them. But like I said, so worth it, so unique! The buttons themselves are vintage of a mystery era, but amazing nonetheless with their deep-set wells for the stitching spots and the faceted shiny outer edges. They had been a set that I have been itching to use from the first I set eyes on them from in my Grandmother’s stash. They make the bits of rich red in the fabric pop a little better. 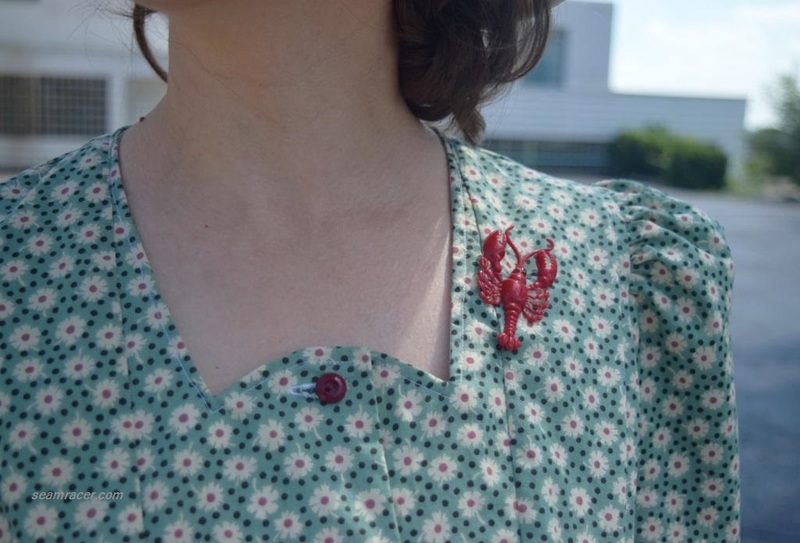 I know what also adds to the red contrast – my lobster pin! Again, I’m not sure what vintage era this is from, but the back pin mechanism is so rudely simple, I’m assuming it’s 50’s or older. I’ve had this as long as I can remember so I don’t know where it came from or who gave it to me. I’ve always seen it in my jewelry box ever since I first had such a thing. Finally after all these years of keeping the lobster brooch and having mixed feelings about the combo of weirdness, ugliness, and cute quirkiness of it, I like that I have now found a way to enjoy and wear a time honored piece from my jewelry collection. I feel it properly ties together the colors, the historical significance dating my outfit, and the ties to famous personas of the past. Speaking of famous persons, too many past Hollywood starlets and fashion designs have included a killer fedora to their ensemble like this one! And this was so easy to make, and it turned out so well, it is ridiculous. 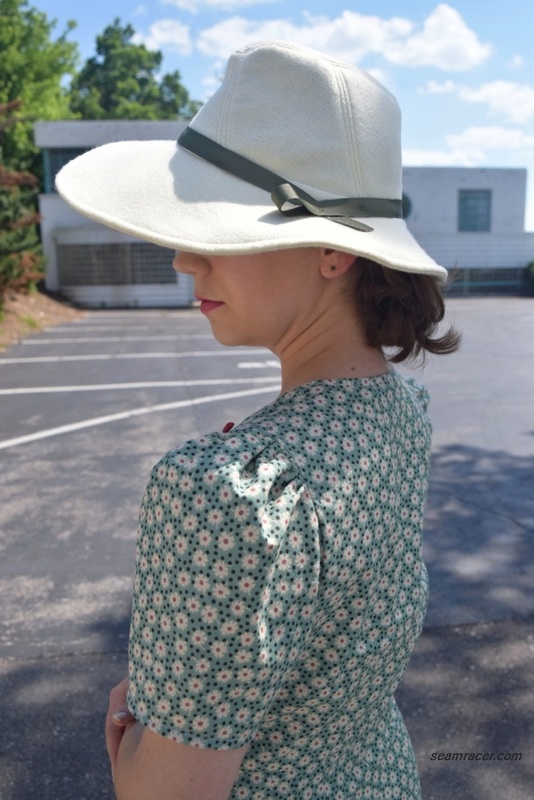 This pattern is like a hidden gem, because everyone seems to make the View E 1920s style cloche hat (they are all awesome) but I only found one other version of the fedora style on the internet. It is the perfect style for anything late 1930’s into the early to mid-40’s, and really should be labelled as retro or at least vintage. Just look at how it matches up to these images from 1938! 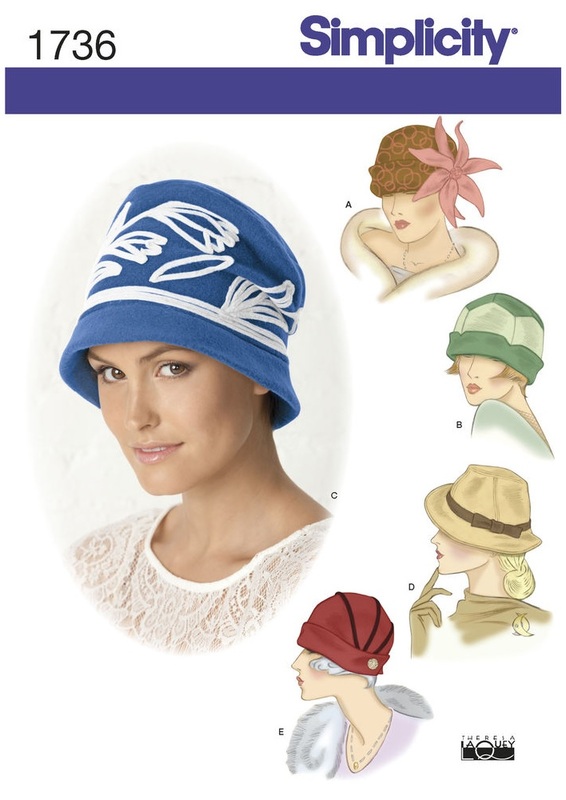 Find this pattern for yourself, and please do sew this hat! The design of the hat is like a hidden surprise. It wasn’t until I began to make the fedora that I realized its lovely tailoring, something that isn’t even apparent from the line drawing even. Every panel to the crown is its own specialized piece, cut once, and once sewn together, all of them have an elegant effect of motion by the way the seams are on the diagonal around the brim. Even the top of the crown adds to the wonderful shaping by being a unique, long, oblong oval. The brim accommodates to the overall drama by being shortest in the back, short on the one side, and longest in the front – again, very specialized shaping for a lovely final, finished hat. I did make the front of the brim ½ longer just to make sure to give my face full sun protection. The pattern doesn’t specify lining the hat, and I didn’t since I wanted my hat to be for the summer. It didn’t even say to sew an inner sweat band or ribbon or anything to the inside of the crown/brim seam…rather odd. I merely sewed a wide, cotton, bias band to the crown/brim seam inside for comfort against my head and a clean finish. I played around with the ribbon placement for quite a long time, and had some bold, different experimental ideas (as many hats of those times had fun, unexpected decoration), but ended up going with a rather basic hat band treatment. Part of my success with this hat, I suspect, is the great quality felt I used. I’m not meaning to brag – I don’t even remember where it came from, it has just been in my stash since I’ve been in this house. I know it is polyester, at least 1/8 inch thick, but from the look and the feel of it, and the way it holds its shape so well, it acts like a nice wool felt. Awesome! This gives me the best of both worlds – and my hat is even crushable and washable yet still holds its shape…believe me, I tested this! 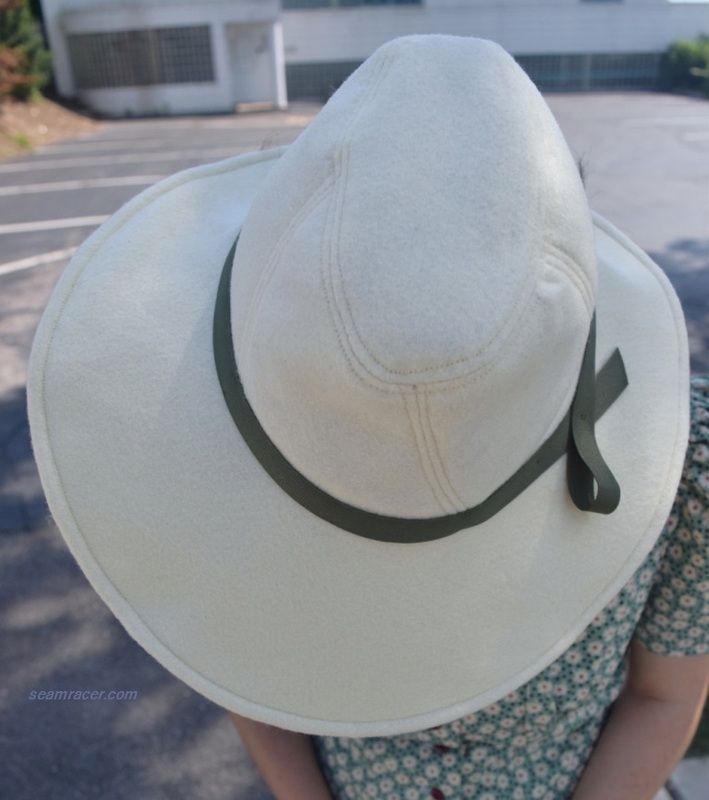 But really, for best results, find a material that has body for this hat, something easy to work with, washable, and that doesn’t need lining to make it oh-so-practical yet stylish at the same time – like mine. You won’t find that combo with a true vintage hat, and even if you did, you wouldn’t want to treat it like that, so come on, sew up your own fedora! I love this hat. There is a tinge of nautical (ahem, cue the lobster, especially) and summer luxury-themed undercurrents to my outfit and our amazing background building for our photos is the icing on the cake! Listed on the National Register of Historic Places, is was designed by a local architect, Eduoard Mutrux (an apprentice to Frank Lloyd Wright) in 1936 or 1938. It is a very strong, very odd but wonderful combination of Streamline Moderne and International Style. This masonry building has all the best of the avant-garde forward thinking that the 1930s did best. However, this building sneakily looks like a lovely white cruise ship when you go and look at other views, as if it had just moored on the parking lot and been swallowed up by asphalt and ground, with its sweeping front facing the busy street below. The Streamline Moderne architectural style is after all about movement merging with stationary objects. Originally intended to cut down on drag for cars, ships, planes and trains, Streamline Moderne designers and architects wanted a classicism to their buildings so they would last and span the test of time. This is the kind of buildings you see in all those vintage travel advertisements of the 30’s that are so enchanting and appealing. Streamline Modern buildings are also almost strictly inspired by movement (visit this Flickr group to see what I mean). The International style is a friend of stark simplicity – form has to follow function and ornament for its own sake is an outrage…to the point of harsh sterility. Cubical balance and proportion was key, along with white being an important color. This style of building was rare in Missouri before WWII. International is a major style that re-blossomed in the 1960s as Mid-Century Modern, and it was also the founding idealism for our modern business spaces made of metal and glass!